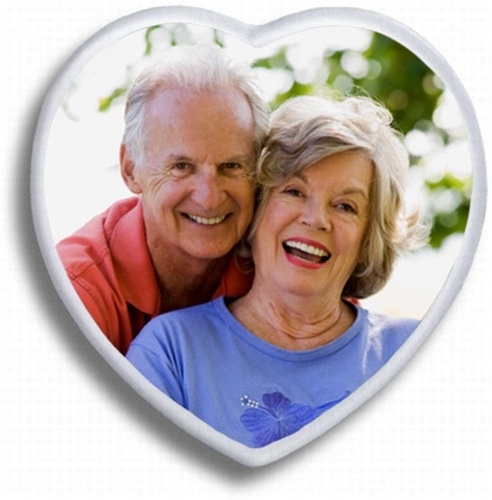 Give an old headstone a facelift or a new one a fond memory with a heart ceramic picture. Each heart porcelain picture has a baked on image and an adhesive back, and is designed to outlast the seasons. Choose from the many sizes, frames available, to personalize your heart ceramic picture. *Note: frame only available with 44T model. These ceramic color heart pictures are perfect for placing on an existing headstone, grave marker or mausoleum crypt front. The heart shape is symbolic of love and intended for couples. Available in two sizes and with an adhesive backing they are meant to be installed by anyone.